The St. Jude Crosson Comprehensive Cancer Center, located in Fullerton, California, is part of the St. Joseph Health System. The cancer center was established in 1998 and includes the Ann G. Fetters Diagnostic Imaging Center, the Fred A. Jordan Family Radiation Oncology Center, and the Kathryn T. McCarty Breast Center. Men with prostate cancer are often treated with hormone therapy (androgen deprivation therapy [ADT]), but this treatment can have unpleasant and even harmful side effects, including metabolic abnormalities that lead to diabetes mellitus (DM) and cardiovascular disease (CVD). The American Society of Clinical Oncology (ASCO) is again participating in the American Board of Internal Medicine’s (ABIM) Choosing Wisely campaign designed to streamline healthcare delivery. Younger, thinner, nondiabetic men were more likely to gain weight on androgen deprivation therapy (ADT) than older men with comorbidities. As a 7-year breast cancer survivor, my primary feeling most of the time is awe and gratitude that I’m still here. I can savor life’s small moments and big events, from sipping a piping hot tall dark roast to celebrating my dear friend’s 50th by dancing my you-know-what off! May 5th is Melanoma Monday, as designated by the American Academy of Dermatology. 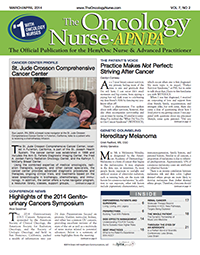 In this issue of The Oncology Nurse-APN/PA (TON), we discuss some of the “personal” situations we may confront as healthcare professionals.